For the first time Audi has developed its compact hatchback A3 into cabriolet form. Designed to compete with offerings from both premium and volume producers, the A3 Cabriolet has shunned the current trend for folding metal roofs in favour of a canvas version. Audi believes its roof offers no less refinement, but saves on space and weight. Although top down motoring is nothing new to Audi, this is the first time the manufacturer has re-engineered its compact hatchback to offer a cabriolet alternative. While many manufacturers have opted for folding hard tops on their convertible models, Audi clearly feels assured enough of its position as a premium manufacturer to offer the A3 Cabriolet with a Z-folding canvas roof. As well as having less of an impact on space and therefore practicality the canvas roof is also lighter, meaning the A3 Cabriolet can offer more impressive performance, handling and fuel consumption than it otherwise might have. Starting with a well specified base version featuring a semi-automatic hood - the clasps must be released manually before using the retract button - the A3 Cabriolet is also available in two higher specification versions with lowered suspension and additional options. On the Sport and S Line models, the roof can go from fully closed to fully open in nine seconds and can be opened while on the move. 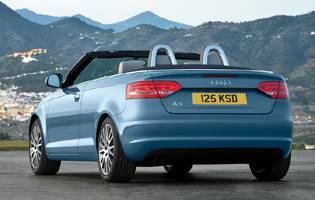 While the A3 Cabriolet is clearly in its element during top-down summer motoring, the model has also been designed to function as a comfortable everyday car. This is where a metal roof can make a lot of difference, so Audi claims to have paid extra attention to ensuring there is no loss of refinement inside the A3 Cabriolet. The company's own research suggests that the increase in noise inside the cabriolet model is as little as one decibel more than in its three-door hatchback counterpart. 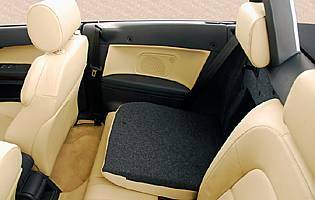 Unlike the hatchback, the rear bench will only accommodate two passengers, but the boot is an impressive size and folding rear seats offer up more load space. From the outside, the model is still very clearly an A3 and the folding roof is incorporated without compromising Audi's trademark understated style. 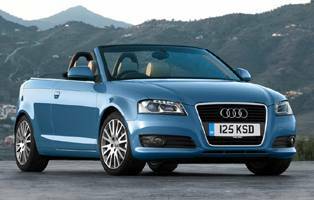 A well-planned, well-built and good-looking cabriolet model, the A3 Cabriolet brings plenty to the sector. It loses very little to the hatchback in terms of driving experience, and the loss of practicality has been avoided as much possible although the hatchback still makes a more sensible family option. The differing trim levels and impressive engine line-up offers plenty of scope for potential buyers.